They’re calling it the farm-to-bottle, `boutique booze’ movement. Connoisseurs of quality alcohol are looking away from main-market vodkas, gins, rums and whiskies staring eye-level at them from grocery store shelves, and connecting to the artisanal spirit of booze-making that is all the rage in America. Leading this coming-of-age moment in the lives of micro distilleries is the state of Washington, with more than a fifth of the country’s total tally of new and up-coming, farm-fresh spirit-making facilities, with Seattle at it’s epicenter. Your next stop on the `Micro Distilleries In Eastside’ tour is Four Leaf, a wine making, beer brewing and spirits distilling destination. Go there to taste a selection of tea-infused spirits and rums like the Sásta, Tine and Liath, served up in customized herb-inspired cocktails, like the alcoholic Earl Grey concoction or the classic Martini with a local, apple-y twist. Schnapsleiche is located in a complex containing several wineries, a brewery, and a cidery — all with their own tasting rooms. Go there to experience a variety of handcrafted spirits including European-style schnaps, gin, akvavit, geist and vodkas. There are also bourbon, rye whiskey, and brandies being made, but as traditional crafting takes many years, these are not available for sale or tastings just yet. Brovo Spirits prides itself as a distillery that recipes its spirits for the middle class. Directions come not from experts, but the grassroots people who really understand alcohol best – the bartenders. Locally sourced ingredients and a no-nonsense approach to creating worthy, hearty amaros, liqueurs and vermouths within the mid-price range that speak of terroir (soil) and native attributes of homegrown ingredients. Years of accumulated knowledge from running a herb business is put to good use at the family-owned Pacific Distillery, where handmade spirits are produced with old-world methods, recipes and equipment. Botanical samplings from around the world are combined with ingredients from their own garden to create Pacifique, a traditional 19th Century absinthe, and Voyager, a single-batch distilled gin that the distillery is justifiably proud of. Try them in Pacific’s unique renditions of a selection of classic cocktails. Owner and distiller Mark Nesheim starts each small batch of J.P. Trodden by grinding the corn and winter wheat sourced locally from Washington state. Since bourbon is a uniquely American spirit, the distillery takes pride in using only American made equipment, including a copper still from Oregon, new oak barrels, and Tennessee glass bottles. At Seaspirits, they start with high quality ingredients, apply a little art, a little science, and end up with some of the finest distilled silver, spiced, barrel-aged and coconut rums that make anything else taste like “mass-produced swill”. Their spirits appear lighter in color because all alcohol comes off the still clear and then changes color because of added ingredients or barrel aging. They don’t add any artificial colors or sweeteners to their products. Others make spirits from grapes, but at Grapeworks, they make singular varietal grape vodkas and brandies. And `Grape Spirit’? Apparently this one is so unique that they had to get special permission from the Feds to make it, let alone use the name. Grapeworks’ grape spirit is neither a vodka nor a brandy. It is an interesting spirit with high character, distinct aromas and flavors that can be enjoyed alone or mixed with cocktails. 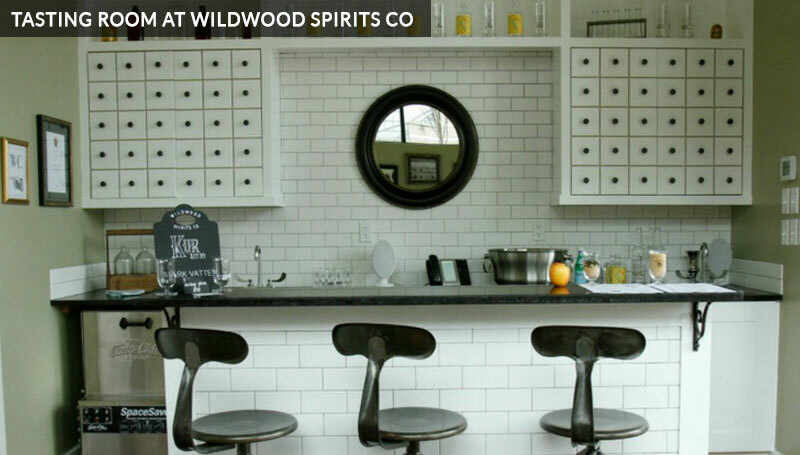 Your last stop in the `micro distilleries in Eastside’ tour. Pure water from the Cascade mountains, grains grown exclusively at the Omlin third-generation, family-owned farm, and an ideal aging environment in Woodinville are some of the magic ingredients go in the crafting of their straight bourbon, straight American and straight rye whiskies.